A hermit crabs mission in life is to eat, sleep and endlessly pursue the ever elusive perfect shell. Because hermit crabs have a soft abdomen, they must protect it by relying on another creatures discarded shell. The shell was made by a mollusk (such as a snail for example) that died or was eaten perhaps and the shell was then picked up for use by a hermit crab. The shell isn't part of the crab, it is worn as we wear our clothing for protection and it must fit properly. Hermit crabs carry "shell water" so the shell must not have any "leaks" to where it is unable to hold the extra water that the crab uses to regulate his body fluids against as well as drink if necessary and hydrate his gills. A hermit crab is most concerned with a shells opening size. A crab interested in changing shells will take his large claw and reach down inside a prospective shell to make sure that it is the correct size. After thoroughly checking out the shell opening and if the shell passes that first test, he will proceed to begin to roll the shell around and around to empty out any possible debris and of course to make sure that nothing else is living inside. Finally, when he's sure that the shell is completely empty he will position his body in such a way as to minimize his abdomens exposure and will then make the switch. Frequently when other crabs are around, he may attempt to hold his old shell by keeping a walking leg in it. Just until he's absolutely sure that he's happy with the new one. It's not uncommon for a hermit crab to get "buyers remorse" and decide that his old home was better than the new one. It's antics such as this that make watching hermit crabs so much fun. When choosing extra shells for your crabs, it is important to keep in mind that hermit crabs grow very slowly. Check to see that your crab can adequately pull into his shell. A good fitting shell is one that will allow the crab to completely retreat inside and his large claw should act as a door. Use this ideal fit to gauge your extra shells. It's a good idea to choose several shells that have similar opening sizes as what he is currently wearing and several that are just slightly larger. It's important not to skimp on providing your crabs with properly sized extra shells. Crabs have been known to forcibly evict other crabs and in the process can lose limbs or even die. They take their shells or lack thereof, very seriously! One of my Jumbo crabs "Biggie" decided to change out of his favorite African Snail Shell and another crab "Strawberry" decided to move right into it. After changing, Strawberry proceeded to bury for his annual molt. I could tell Biggie had "buyer's remorse" but couldn't find his old shell. He kept changing into other similar shells but just wasn't content. He finally settled on one that would make due. Almost 3 months later, Strawberry resurfaced, freshly molted. Immediately Biggie approached him from behind and began rocking him trying to evict him from "his" old shell. I heard Strawberry croaking and separated the two into different corners of the cage, figuring that would be the end of it. I was sadly mistaken. I found Strawberry dead the next day missing a walking leg and large claw. I looked for the culprit and sure enough Biggie had "his" old shell back. I'm always amazed as I tell this story about the Jumbo that held a 3 month grudge, but it illustrates the point that shells are not to be taken lightly. It is a matter of life or death to a hermit crab. Another important point to make about shells is that not every shell can be worn by a hermit crab. Some are more suited and favored than others. We have carefully selected shells that are preferred by land hermit crabs in The Hermit Crab Patch store. We try to offer a selection of both new and "previously worn" shells, something to fit everyone's budget so that hermit crabs don't have to go without for the above reason. As cute as some of the painted shells are, we have decided not to carry painted shells due to the materials currently being used. I've spoken with shell companies about my concern regarding toxicity of the paint. Most companies assure me that the actual paint itself is nontoxic, but the coating used to protect the paint from chipping is an automotive clear coat finish. When crabs are kept in a sandy substrate deep enough to bury as we advocate, the sand acts as sand paper and eventually the shells begin to chip. Since hermit crabs eat so much of what is in their environment, there is a chance they could ingest that. I just don't feel the risk is worth it. 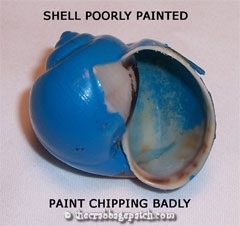 So, until a material is used that is completely harmless, painted shells won't be offered. 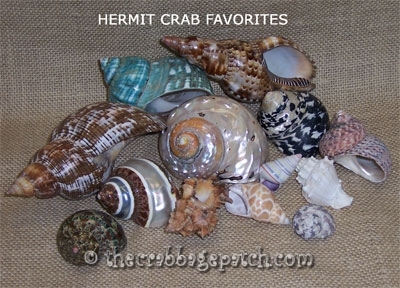 In addition to the beautiful natural shells offered, The Hermit Crab Patch carries beautiful carved shells in a variety of designs and a selection of shells that have been buffed and polished as well, all without harmful coatings or paint.